Coconut Flour Pancakes are paleo friendly, dairy-free, gluten-free, and delicious! Learn 2 ways to make nutritious coconut flour pancakes! 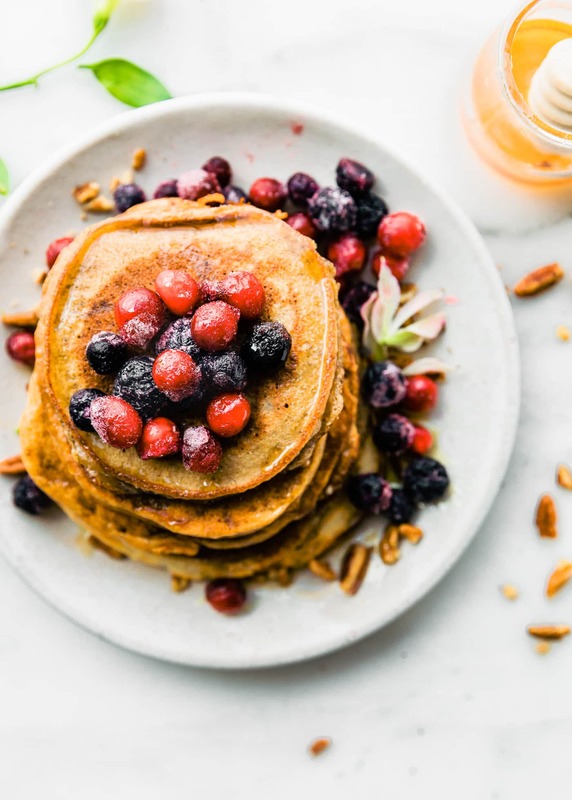 This grain-free coconut flour pancakes recipe can be made naturally sweet with the addition of banana, or lower carb and with no sweetener added. Either way, you’ll be hooked! Well well well, look what we have here. The third pancake recipe, like legit pancake recipe, I’ve ever shared. I did not cheat this time and make pancake bread, although that’s equally delicious. Nope, today’s recipe is brought to you by old blogger syndrome. An OLD 2013 recipe I finally brought back to life again, and in two ways! 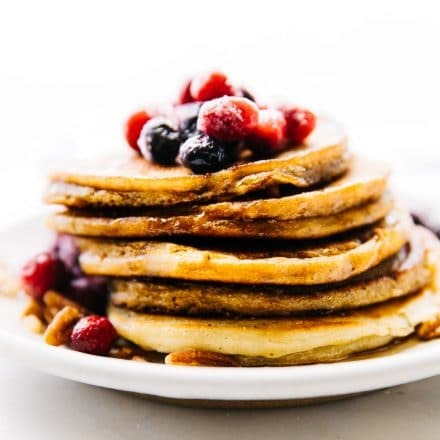 Coconut flour pancakes that are lightly sweetened with berries and banana. And coconut flour pancakes that are low carb, no sugar added, and make an excellent pancake brinner with sausage or eggs. You drooling yet? Okay good! Cause if you’re like me, you’ll make a ton of these at once and freeze them for meal prepping. 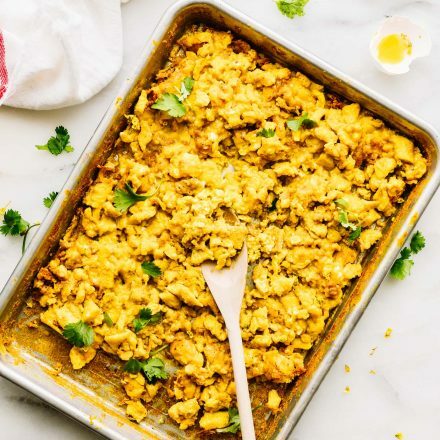 Or, you might just want something easy and healthy to make for Sunday Brunch. Either way, you’re winning and that’s what we like to hear. You see, 5 years ago my husband was knee deep in triathlon training. Sundays were his long run days, which meant that I was in charge of recovery meals. Hence the pancakes. Well, back then, keto was not a thing, but grain free was definitely thing in our household. We tested out tons of grain free recipes for post recovery fuel. And guess what we found? IT HELPED with recovery and reducing inflammation. At least for us. To each their own, right? 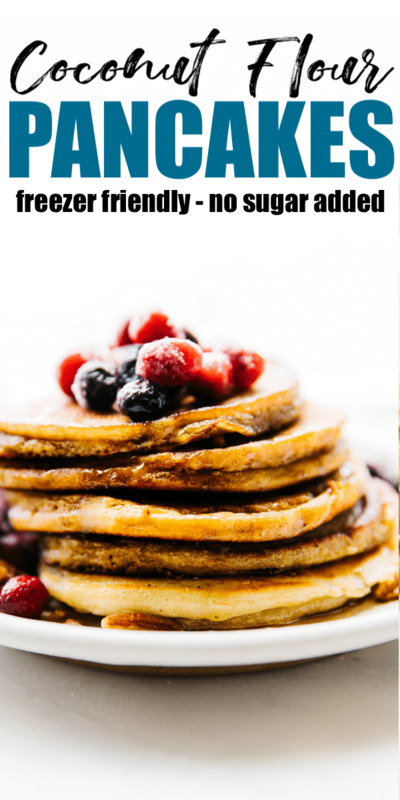 Today I’m sharing that oldie but goodie grain free pancake recipe made with just a few ingredients. Coconut flour being key! 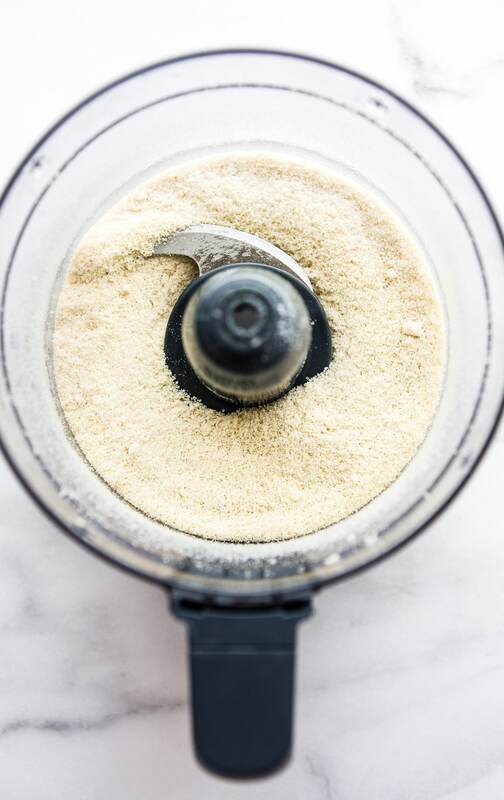 If your coconut flour is clumpy or heavy, grind it in the food processor before using in a recipe, like say… a coconut flour pancake recipe. Let’s discuss these two options here, shall we? The first way to make coconut flour pancakes is the lightly sweetened way. Blend in a banana and that’s all you need for perfectly lightly sweetened paleo pancakes. If your body needs more natural glycogen (sugar) and carbs, drizzle that maple syrup on top and smidge of nuts. BALANCED MACROS YO! 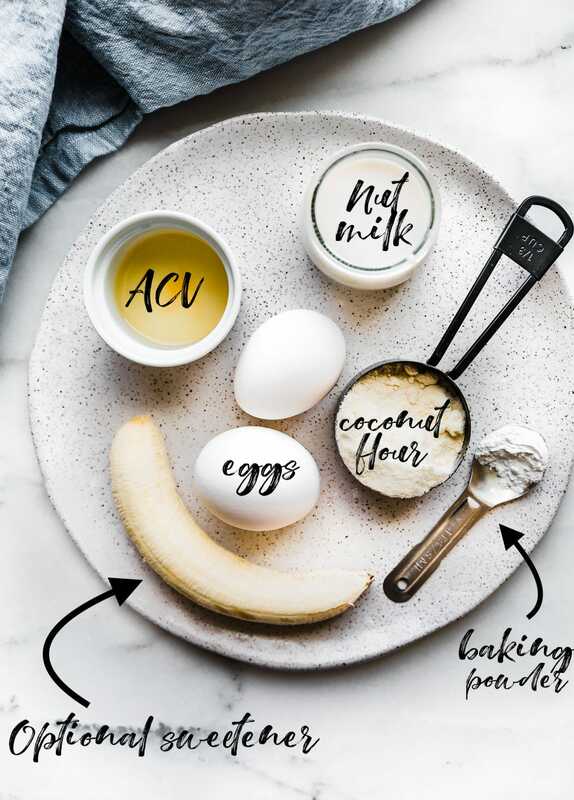 But… if you’re looking for llower carb paleo or sugar free pancakes made with coconut flour, then just skip the banana and use my adjustments in the recipe below. Both are delicious! The coconut flour pancakes without banana cook faster and are a different texture, but it’s all good because you can fancy them up however you’d like. Obviously I have a serious obsession with flowers, so my coconut flour pancakes come with a side of edible flowers, nuts, and berries. No syrup needed. 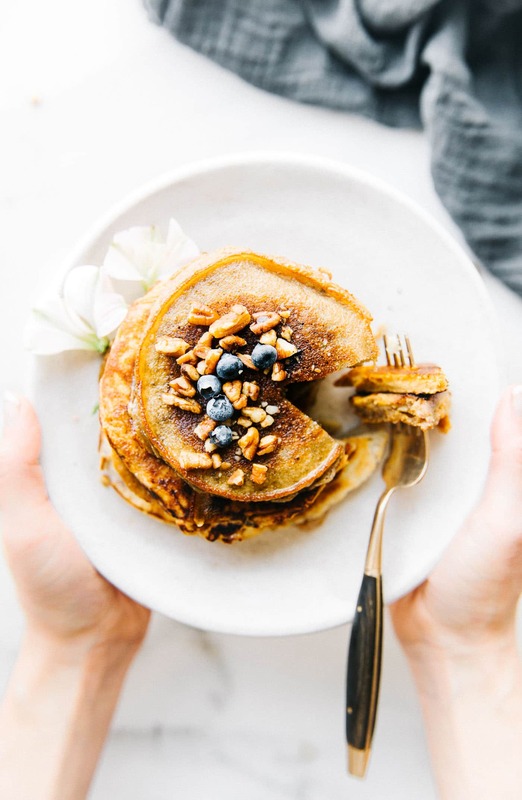 Either way, these grain free pancakes (2 ways) will be satisfy that carbalicious craving. I made 2 batches abd froze half for the next weekend. Actually, I lied. I froze half then had a serious hankering for pancakes midweek. So I thawed out a few to go pair with poached eggs. It was my solo dinner brinner and It was glorious! grain free coconut flour pancakes, made 2 ways; Lower carb or lightly sweetened. Paleo friendly. Before you start – See notes on cooking techniques and times. First place egg and milk in a blender or bowl to mix/beat. If you’re making the banana version, blend the banana in with the eggs and milk first. Mix in the the coconut flour (a little at a time, whisking) with the egg/milk mix until smooth and not clumpy. Gently stir in the remaining ingredients and beat/blend again until smooth batter is formed. Place in fridge to set for 10-15 minutes. Remove from fridge once batter has set. Heat a skillet to medium high, adding a few teaspoons of oil to coat the pan. Once hot, scoop 1/4 cup batter and pour into the center of the pan. Pancakes flip better with thinner batter (See notes). Also, a crepe pan or non stick griddle for pancakes works best! Cook until the edges start to brown or the middle starts to bubble, which is usually no more than 2 -3 minutes. Flip over and let pancake cook another 1-3 minutes. See notes for cooking times. Remove pancake and place on plate. Repeat to get 3-6 pancakes. The banana sweetened coconut flour pancakes will produce more. All 5-6 inches wide. 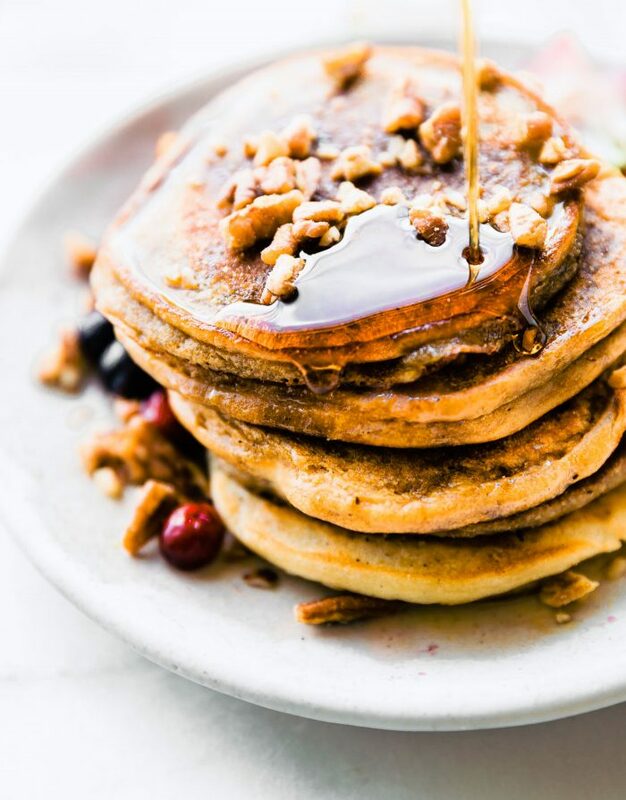 Top pancakes with extra berries, nuts, and, butter, optional maple syrup. Notes -If you don’t have ground flaxseed, ground chia seed or 1 tbsp tapioca starch should work. Cooking tips for both kinds of pancakes –Cooking times will vary per pan. A cast iron will cook the pancakes faster. A crepe pan will cook more evenly. I used a large skillet (stainless steel) which works great but I recommended adding a little oil or butter after making 1-2 pancakes. Flipping tip – pour the batter into the pan then thin it out (tilt pan) so they cook evenly and flip easier. The lower carb pancakes make 2-3 per batter. They will cook faster and are more brown in color if you are using cast iron. The batter is thick but will cook up more fluffy.The coconut flour pancakes with banana create crispy edges. They are delicious and will fry best in crepe pan or cast iron. They are thinner in textures. Both freeze well! Sorry kiwi, I just ate the pancakes I promised to save you. 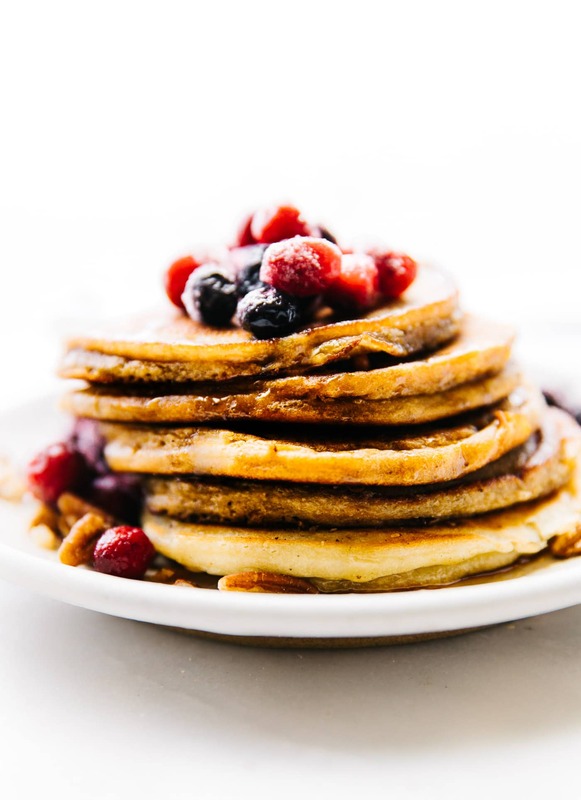 What’s your trick to making grain free or paleo friendly pancakes? These pancakes look delicious and perfect for weekend brunch! YUM! You read my mind friend! This is the worst coconut flour pancake recipe I’ve ever used. I followed the directions to the letter (I made the second recipe without banana). The pancakes completely fell apart & had a horrible aftertaste. Never using this recipe again, I’m sorry. I’m so sorry to hear that. We’ve had others make this just fine. What pan did you use? What brand coconut flour? It’s okay, I just wanted to leave an honest review. I used a non-stick skillet & Bob’s Red Mill Coconut Flour. I would try these again! Maybe something was just a little off when you made them?! I’ve made them both and had great success! I made the unsweetened recipe exactly and mine fell apart too. I used non stick skillet Tusker Brand organic coconut flour. Oh no. So sorry! I don’t think it’s the flour. I have found that it’s crucial to use a certain pan, like a pancake griddle, crepe pan, or quality cast iron for the low carb. I posted me making them on ig stories. Happy to show you if needed! I love the slightly sweet flavor coconut flour gives to pancakes. Also the toppings on this are just so good looking. me too! it’s just the right amount of sweetness. We love pancakes in our house so a low carb version is a must! These look perfect for our lazy weekend coming up! Maybe I will do breakfast for dinner and have these pancakes tonight! OMG! I used to make coconut flour pancakes ALL the time in high school! They tasted amazing. I really want to see if I can make vegan coconut flour pancakes, but it would be challenging to find a good egg substitute that doesn’t dry out the batter too much! I so need to try the vegan version. POndering. Maybe Bob’s redmill egg replacers? I’m going to have to try BOTH ways for sure! 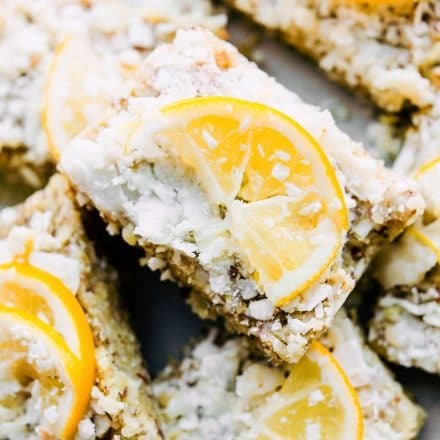 Coconut flour is great for these – slightly sweet and delicious! One more delicious I never made this but tomorrow I’ll make this soon… I just love your site for making all the best and delicious things. I love me some coconut flour pancakes! I haven’t had pancakes near enough lately. Or breakfast for that matter. Move in with me? Going nuts for these! They look so delish! These are awesome! I wanted the banana pancake texture, but low carb, so I subbed cream cheese for the banana and psyllium husk for the starch and added a little stevia, and they had fabulous texture and flavor. Thanks for the recipe! I used an electric griddle and buttered it up pretty well to ensure they wouldn’t stick and would form well and flip well. I didn’t add bananas to this one, and yes, it was apple cider vinegar. It may be just my taste for Apple cider vinegar. I would make sure you’re using the highly quality ACV! 🙂 I get the best results when I make them thin! Hope this helps !! Really? Oh that’s so sad. We make them a lot! What version did you use? Wonderful! So glad you liked them Allie! I made the version with the small banana. Really delicious! Thank you. What is the apple cider vinegar for? I googled it and it said it was for making sour milk (like buttermilk) but that’s not what you’re doing here so I’m not understanding its purpose? I use apple cider vinegar in baked goods recipes in conjunction with baking soda as a leavener. It helps give it that fluff! 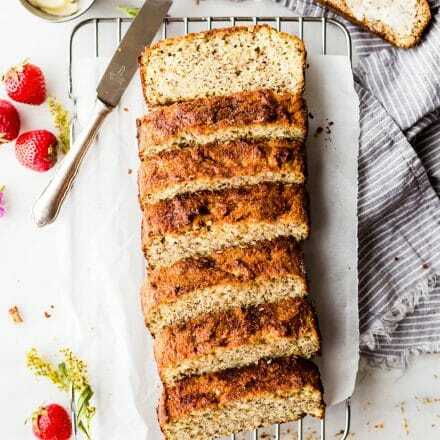 Made a vegan version of this recipe with 1/2 cup applesauce, unbleached raw sugar, and three bananas… Next time, less bananas, more “flax or chia egg”, and no applesauce. I DID manage to get rid of the vinegar taste though. Great recipe: I am going to try to make another vegan version again soon! Oh amazing! Keep me posted on that version Amanda! Lindsay, thanks! These pancakes are faaantastic! My kids would love it! Lindsay, what a great idea! I love pancakes. Your version really pleases me very well, with ingredients that I often use in cooking too. Lindsay, thank you! I just made this recipe tonight and everyone loved it! Very easy and delicious! Thank you! Lindsay, thanks a lot for sharing! Very tasty pancakes. My son will love it! Thank you! These are a favorite in our house, I hope he likes them too! Lindsay, it’s amazing! 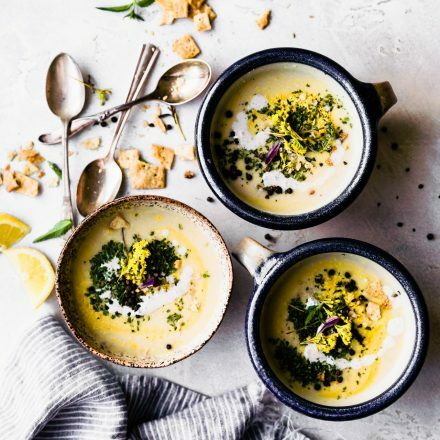 I just randomly found your blog looking for this recipe. Awesome! Good for you! Oh thank you Polly! I’m so glad that you enjoyed them. I appreciate you taking the time to let me know as well. I just tried these yesterday and they are the best recipe I’ve tried yet. They look and taste like real pancakes to me. I have not had the best of luck substituting coconut flour in many recipes, so am super thankful for your trials and advice. I must say the look/consistency of the batter had me worried up until the flip, but I was shocked and thrilled with the result. Perfect tiny little coconut pancakes. They were adorable. It’s too bad I can’t attach a photo in this format because they really were that cute (and tasty). Thanks to you for sharing this recipe. Isimply attempted these yesterday and they are the best formula I’ve attempted yet. They look and pose a flavor like genuine hotcakes to me. I have not had the good luck substituting coconut flour in numerous formulas, so am too grateful for your preliminaries and counsel. I should state the look/consistency of the player had me stressed up until the flip, however I was stunned and excited with the outcome. Flawless modest little coconut hotcakes. They were cute. It’s too terrible I can’t connect a photograph in this format. since they truly were that charming (and delectable). On account of you for sharing this formula.